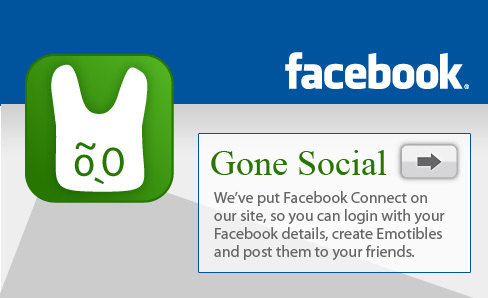 We've implemented Facebook Connect here on Emotibles.com to let you login and create Emotibles with your Facebook login and more! Now you don't have to view Emotibles.com in Cranky red. Introducing 24 new site themes, one for each of the original Emotibles! 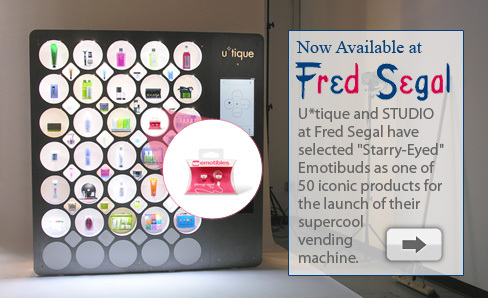 For the exclusive launch of their supercool luxury vending machine, U*tique and STUDIO at Fred Segal have selected our "Starry-eyed" Emotibuds as one of 50 iconic products among "today's must-haves in beauty and luxury." 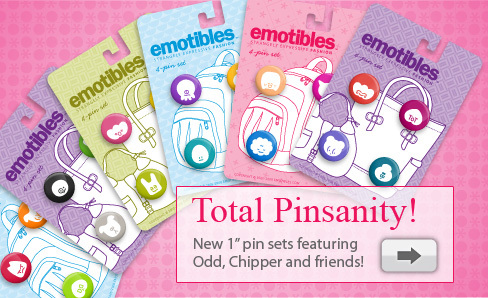 Introducing a completely renewed line of Emotibles one-inch round pins, now in colorful giftable sets! 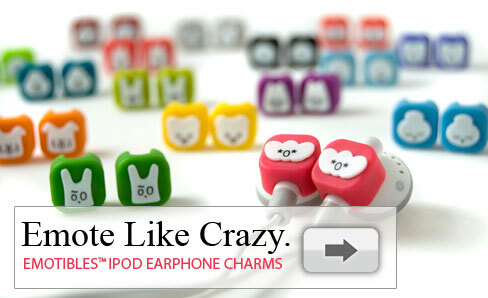 As of January 1, 2009, new Emotibuds purchased from Emotibles.com feature a slightly altered design, molded to fit both classic and the newest standard iPod and iPhone earphones (pictured) WITHOUT inserts. Spread some holiday cheer with our free holiday e-cards! Choose from three ready-made designs or customize a card with your own Emotibles by clicking "Put me in a holiday e-card" on any Emotible page. We asked you to design Chihuahua Emotibles to suit Mister, the Wanderful Chihuahua. There were 805 in all, and it was so hard to pick only 3 winners! Happy Turkey (or Tofurky) Day!